This weekend, I wanted to prepare something fun for Lulu. She’s been sick with a cold. She’s rarely sick. But she’s been a real trooper. And so despite her fever and runny nose, she wanted to spend time in the kitchen with me. 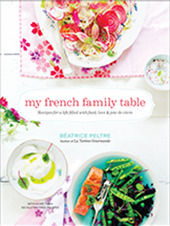 “Je veux cuisiner avec toi maman,” (I want to cook with you mummy) she said when she watched me peel the small beets I had kept from one of our late farmer’s markets. I had meant to keep them as long as I could. I had fallen in love with the colors. Amongst others, Lulu likes crunchy foods. I am not blaming her. I do too. I knew that a bowl of finely sliced beet chips would make her happy. All of us, as a matter of fact. So we cooked together. And we prepared beet chips. I can still see her eyes lighting with excitement when she noticed tiny bubbles form around the slices of beets inside the boiling oil. “Regarde toutes ces couleurs maman !” (Look at all of these colors mummy) she added. She was right to notice. They looked really pretty! “Tu veux ajouter le sel,” (Do you want to add the salt?) I asked. Simple things to cheer my Lulu up. And help her feel better. Thank you so much to all of you for your emails about the workshop. Lara and I are really happy to have received such wonderful feedback. We will be back with more information about to register very soon. Pat the beet slices dry between towels. Transfer to a large bowl and sprinkle with brown rice flour and a dash of ground coriander. Shake off the excess flavored flour. In a medium-sized pot, heat the oil on high heat. When hot, add the beet slices, making sure that you are not overcrowding the pot. Let the beets fry for a few minutes, until they look crispy. Using a slotted spoon, transfer onto paper towels to cool. Repeat until you run out of beets. Once cooled, transfer to a bowl and sprinkle with fleur de sel. Enjoy! Mettez les tranches de betteraves dans des serviettes pour enlever l’excès d’eau. Transférez-les dans une grande jatte et ajoutez un peu de farine et de coriandre en poudre. Mélangez bien, et enlevez l’excès de farine. Dans une casserole moyenne, faites chauffer l’huile sur feu fort. Une fois l’huile chaude, ajoutez des tranches de betteraves, sans trop en mettre dans le casserole en une fois. Laissez frire pendant quelques minutes jusqu’à ce que les chips de betterave aient l’air croustillantes. Sortez-les de l’huile, et mettez-les sur du papier absorbant. Répétez avec le reste de betteraves, jusqu’à épuisement des légumes. Une fois refroidies, mettez les chips de betterave dans une jatte et ajoutez de la fleur de sel. Dégustez sans attendre ! The colors are so vibrant, Bea! What a lovely thing to make with Lulu! My mother always made me soup when I didn’t feel well…I so wish that she had made me these instead! Hope Lulu is feeling better! C’est trop joli ! Des éclats plein les yeux … Ton ( ou ta ? ) Lulu a du être rapidement sur pieds avec une assiette aussi vitaminée. De vrais petits bonbons dans l’assiette. Merci Bea pour tout ce que tu offres et partages. 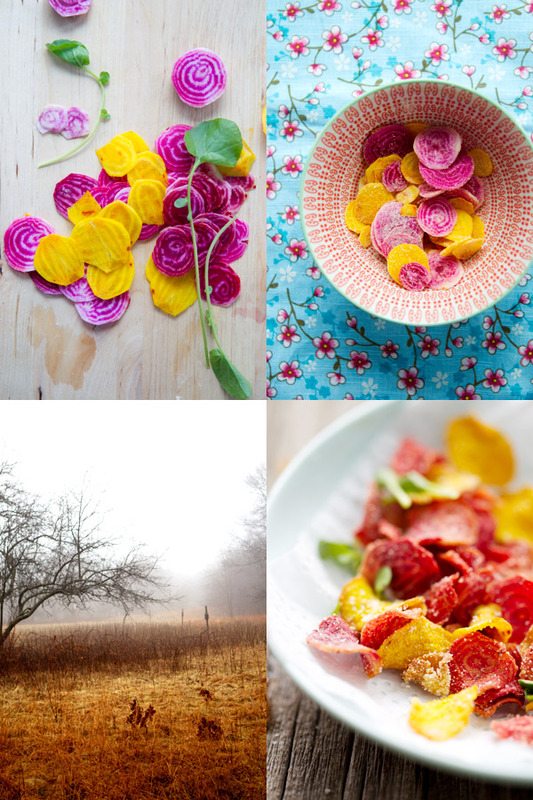 What beautiful contrast between the bright beets and the moody weather. I’ve been meaning to try a baked beet chip recipe I found! I love the colors, too. Amazing. 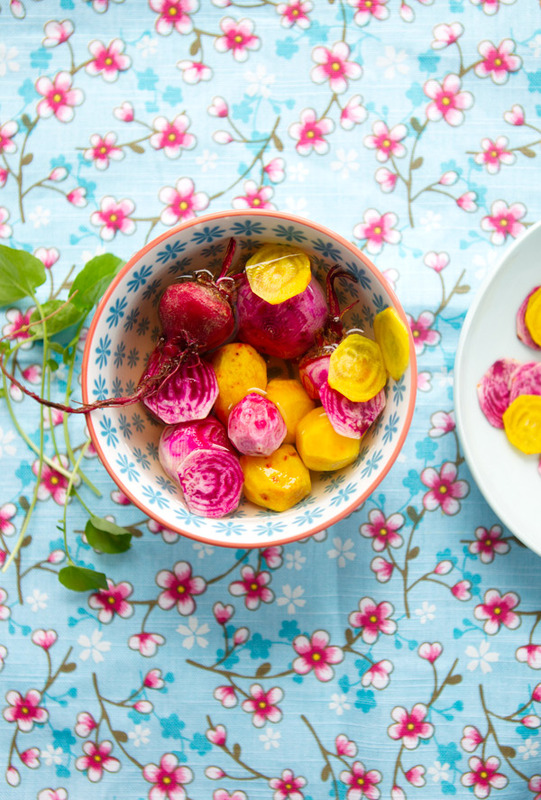 Do you par-boil the beets first, or peel with a vegetable peeler? I hope your little helper is feeling better soon! Could these be made via baking? I’ve baked kale chips before which are excellent and crispy and would love it if I could do the same with beets. I love your vibrant photos in this post. You have made everything look so lovely. Thank you for sharing your story. and get well Lulu. 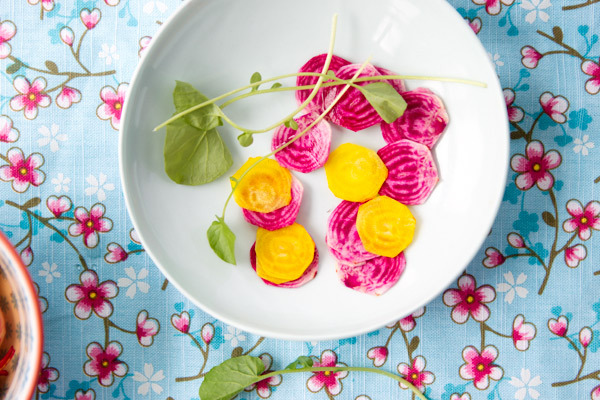 Beets are just gorgeous to look at! And beet chips are the best!! C’est magnifique ! jolies couleurs, jolies formes. A essayer, je note. merci !! 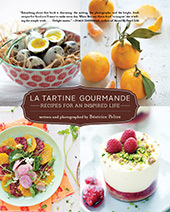 Three kinds of loveliness: 1) Mummy and daughter happiness, 2) Gorgeous photos, and 3) Fun recipe! Lulu is quite right, the colors are magnificent! I hope she is feeling better! I love beet chips. Besides being delicious, they are so colorful too. What a beautiful splash of sunshine and color! Jamais je n’ai goûté à des chips de betteraves. Je crois bien que je vais me lancer, ça donne tellement un bon résultat! Those look SO amazing! And the little flecks of fleur de sel, just stop it. I die. I want. What a beautiful idea. I love beets anyway you slice them and these would be so good in a salad for a surprise fun. Even inside a sandwich. Pauvre Lulu.! Heureusement qu’elle a une maman magicienne! It’s a healthy and colorful snack! Always I said the same but I love you pictures! They look like beautiful little roses. I can’t wait for beets to come into season and try this recipe. Thanks for sharing! C’est magnifique, je tenterais bien dans une version cuite au four. A good, healthy way to take the little one’s mind off her misery. Hope she’s better now. Wow… when I was sick I got a bag of goldfish… never something so pretty! A fun recipe and great idea. SO beautiful! I would have expected these to look (and taste) so good. I love an excuse to make more beets! Beautiful post, pictures, recipe. Hope Lulu is feeling better! Elles ont l’air très bonnes! J’ai jamais essayé, mais c’est certain, je note! 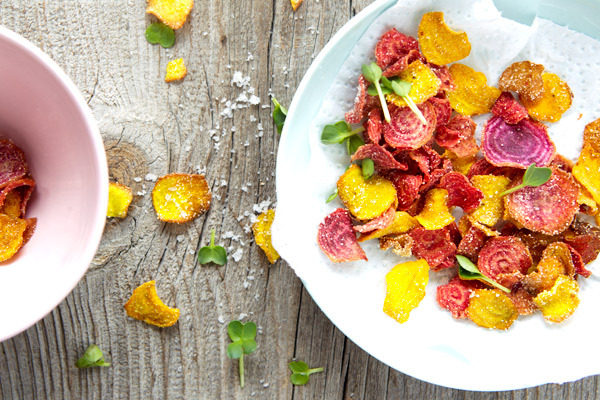 I’ve never had beet chips before but these look so easy and delicious! So pretty and looks delish!! Such vibrant colors. Love. I make baked beet chips at home. I’m sure they are much better deep fried! I love beets. These look like rose petals! So beautiful. Thanks for this recipe. me encanta la remolacha muy bella receta parecen hojas de rosas una exquisitéz,abrazos y abrazos. Wow, these photos are just gorgeous! I’m now on the lookout for fancy, colourful beets. thanks for the inspiration, and for sharing! 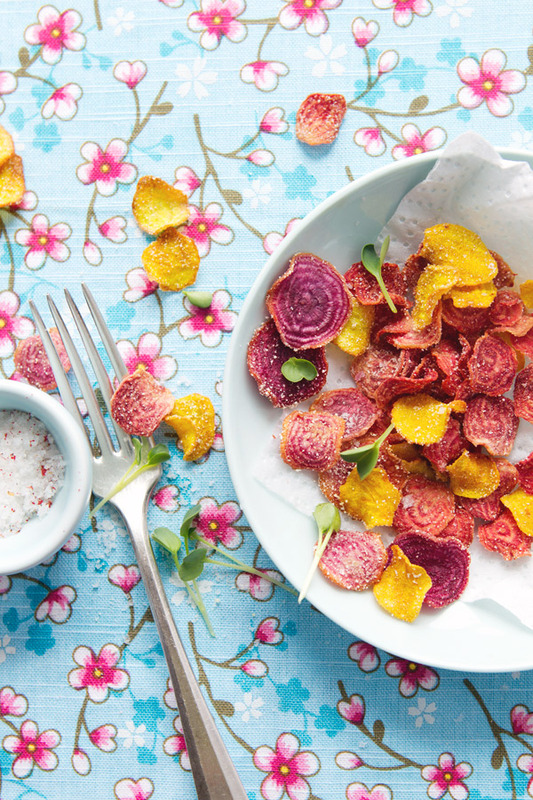 I am laughing because I made beet chips with coriander the other day for my LULA! how funny. I was attempting to do them in the oven… they were yellow beets and some kept their color and some turned grey! : ( I was winging it. Next time I will follow this recipe. The coriander was super tasty however and i did a lime salt. Your blog is super beautiful! I love the vibrant colors. I’ve tried to make beet chips and they didn’t turn out well. Your instructions sound exactly like what I did; however, I did not use brown rice flour. Mine absorbed too much oil and lost their color. If I took them out early to preserve the color, they weren’t crunchy. Any suggestions? Thanks, Bea! Kale chips seem to be pretty popular these days, but these beat chips look great. The vibrant color is a bonus for sure. I’ve been suffering from terrible cold like your daughter’s and looking for some good food to cure me. And I came across your website! 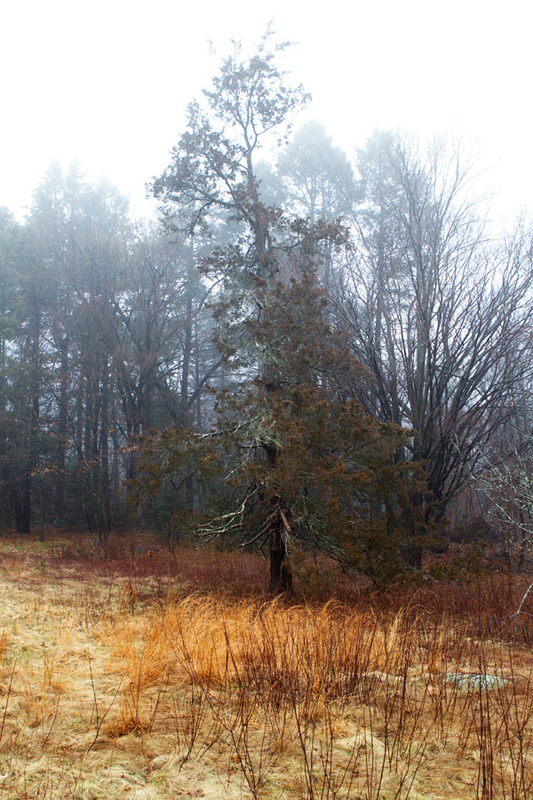 Beautiful photos and writing. Love your blog. Pingback: Zo haal je de calorieën uit je favoriete eten!